Hey there! Thanks for dropping by Movie Reviews! Take a look around and grab the RSS feed to stay updated. See you around! After a May day very far from spring with the cold wind and the rain beating us almost all day I wanted to watch something with a little atmosphere having a hot cup of chocolate between my hands. 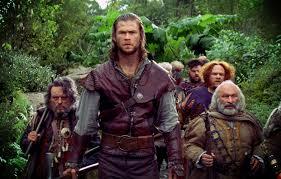 So I made myself comfortable to watch yet another fairy tale, Snow White and the Huntsman. And I loved it! The first part of the film stays true to the original fairy tale by the brothers Grimm; it is dark and mysterious and scary! Depicting the beautiful stepmother as having heavy psychological problems because of rejection and poverty during childhood, the evil queen was really evil but for a reason. There is a twist in the tale when Snow White finds shelter in a village suffering under the queen’s reign; thus meeting her own people and understanding their problems. She meets the dwarves later who lead her in the magic forest and accept her as their saviour and future queen. 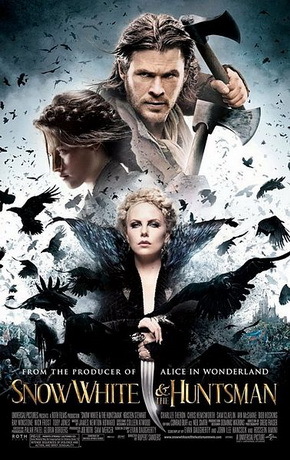 Snow White and the Huntsman delivers the magic that you expect and more. The scenes in the forest are marvelous. The fairies and the animals and the music are all enchanting. The dwarves are just the best! It’s an all-star cast that together add character and more magic to the film. It’s a dark and captivating fairy tale! I’ve seen trailer of the film,but after reading your review i will definitely watch the movie!